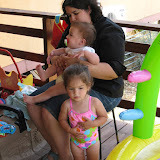 The Eshel Kids: My 2nd Birthday - POOL PARTY!!!!! My 2nd Birthday - POOL PARTY!!!!! Anyway! Happy Birthday Mia! I'm 2 Years old!!!! YAY!